Another is a 40-by-80 foot photomural by Barbara Kruger that slowly seeps into the subconscious of UCSD students and opens the floodgates of existential crises. Located in the Price Center East, a place where students, eat, hang and study, Kruger’s Another towers over said students and reminds them that their time on Earth is both repetitive and boring. 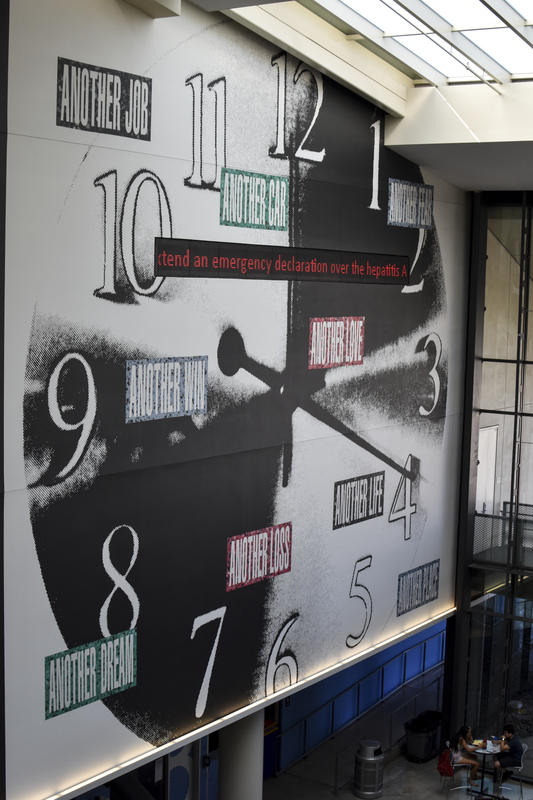 The piece is made up of two ginormous clocks with text like "Another day," "Another dream," "Another place," "Another loss," "Another job," "Another love," "Another dollar," and "Another game." It also has a screen that constantly streams national and international headlines. It kind of makes all of life seem pointless, which of course it is, because we are tiny specks of dust on a slightly larger speck of dus. And where better to remind students of that than a place where they must go every day?! Reactions to the piece have been varied, as they always are, but some are better than others. A bookstore employee pooh-poohed it saying, "It's what -- five minutes on Photoshop? It's not that impressive." I’d like to see him try to be half the genius that Barbara Kruger is, but it’s fine. Another student resented the piece saying, "The point of the art seems to be that life is meaningless. I don't appreciate that it's thrown in my face all the time." A valid point, especially as one is studying but still, it’s astounding how ungrateful kids are these days! The second part of the work is quotes by Virginia Woolf, Malcolm X, Hannah Arendt, Robert Frost, Confucius, and more inlaid in the flooring, which students have deemed as “depressing.” I guess if I had subtle messages constantly questioning my morality and sense of self, I’d get depressed too. Maybe outside one of the campus’ main food courts and lecture halls wasn’t the best place for such a rattling piece, but what fun is college without a complete change of beliefs and some severe mental breakdowns? Ollman, Leah. "Barbara Kruger Goes Back To School." latimes.com. N.p., 2008. Web. 20 Oct. 2017.
" ." Stuartcollection.ucsd.edu. Web. 20 Oct. 2017. "Barbara Kruger’S “Another” At UCSD | Art21 Magazine." Art21 Magazine. Web. 20 Oct. 2017.